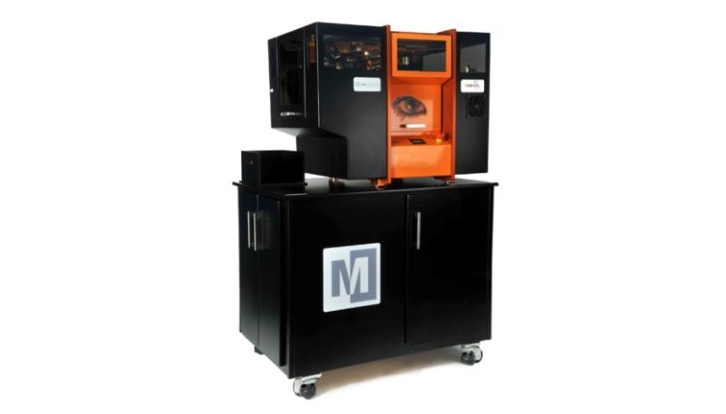 Mcor Technologies Ltd is a 3D printing company based in Dunleer, Ireland. Mcor printers use Selective Deposition Lamination (SDL) technology and have full color capabilities. Mcor printers use business-A4/letter paper as an affordable, yet durable solution to print 3D parts. Mcor 3D printers will be available in Staples stores for customer use. Sheets of standard business paper are fed into the 3D printer. Colored inks are deposited on each sheet of paper and then loaded into the section of the printer where the cutting and gluing occurs. A tungsten-tip blade cuts the shape of the part on the first sheet of paper that is fed into the printer. The blade also cross-hatches the material not used for the part. This allows for easier removal of the support material. Adhesive is then deposited onto the sheet. Another sheet is fed into the printer. The platform moves upward and applies pressure to the newly added sheet of material. The platform is lowered and the blade cuts the shape of the part on the second sheet of paper. The process is repeated until the part is complete. The part is then removed by cutting it out of the support material. History of Mcor Technologies Ltd.
Mcor Technologies Ltd. was founded by brothers Drs. Conor MacCormack and Fintan MacCormack in 2005. The brothers wanted to bring affordable 3D printing to the general public. Dr. Conor MacCormack realized while working on his PhD at Trinity College that only one student could afford to 3D print a model. He and Fintan began working on a 3d printer, and in 2005, Mcor Technologies Ltd. was born. The MacCormacks improved the technology of Laminate Object Manufacturing (LOM) by replacing the laser with a tungsten blade and only gluing the paper to be used for creating the part. In old LOM technology, the entire sheet of paper was glued together, making removing the support material very difficult. However, with the Mcor 3D printers, removing the support material is easy since it’s not glued together.